For a few months now I’ve been publishing a “Letter from America” in the monthly Arts & Letters supplement of the Dhaka Tribune, a new English daily in Bangladesh. I’m reposting them here after they’ve been published. This one was published on May 6, 2013. You can read the Arts & Letters Supplements here. A few years back I made several road trips across the United States. One afternoon I was leaving a small town in Massachusetts when I stopped at a roadside store. It was run by a Bangali couple who had come on lottery visas. Not finding work elsewhere, they had agreed to manage this store owned by another Bangali. They looked miserable. Now and then, I hear of Bangladeshis in remote places. In Mali, on the edge of the Sahara. In the Amazon, waiting to cross a border. Meanwhile in countries like the U.S. and even in Japan and Italy, there are now settled communities. Bangladeshis abroad are also showing up as fictional characters – not just in narratives created by our own émigrés but by outsiders too. In some, they are major characters, as in the Korean film Bandhobi, Zadie Smith’s novel White Teeth, or Nell Freudenberger’s The Newlyweds. Recently I was transported to Rome in a novel originally written in Italian by an immigrant from Algeria. 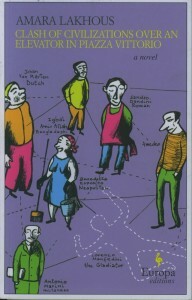 Amara Lakhous’s Clash of Civilizations Over an Elevator in Piazza Vittorio has a cover with six hand-drawn characters. They include Iqbal Amar Allah from Bangladesh. I’m not sure why Lakhous spelled his name this way; we’d know him as Iqbal Amirullah. The novel is set among residents of an apartment building in Rome’s Piazza Vittorio, the same plaza featured in De Sica’s film Bicycle Thieves. Other characters work nearby: Iqbal runs a grocery store, Sandro operates a bar, and Abdallah sells fish. The plot revolves around a man found murdered in the elevator and the disappearance of Amedeo who becomes the prime suspect. The story is told in the voices of the different people, alternating with notes from Amedeo – ‘wails’, he calls them – where he comments on the prior chapter. As the novel builds toward revelation, we learn who committed the murder and discover Amedeo’s identity. 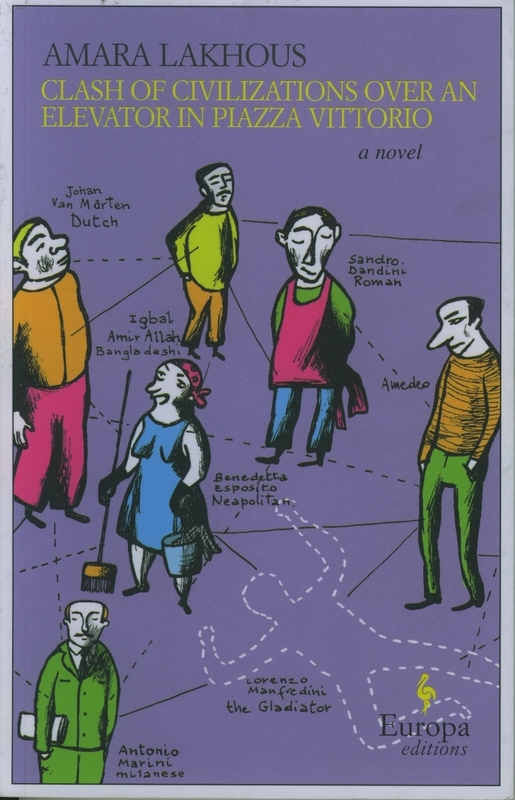 The book probes Amedeo’s identity through both his wails and his reflection in others’ eyes. Readers are challenged on who and what is Italian in today’s world. The book has been made into a film. I’m not sure Iqbal made it into the film. He wasn’t central to the plot. The story would fit well in any of the world’s immigrant destination cities. As an imaginative exercise I try to adapt the setting to Dhaka. Dhaka has apartment buildings – with elevators. There’s a start. The concierge Benedetta from Naples could be replaced by a caretaker. Unlikely to be a woman, so a man from Noakhali? The other longtime Italians could be matched with Bangladeshis of varied backgrounds. Marini, the snobbish professor from Milan, could easily be played by a retired ambassador. Maria Cristina, the Peruvian caretaker of an elderly resident, could become a nurse from Kolkata. Johan Van Marten, the Dutch film student, could play himself. Iqbal could also play himself; tired of being called a Pakistani by Benedetta or having his Muslimness questioned by Abdallah, he returns from Italy to open a pizza joint. What about Amedeo? Where do we find a refugee with tragedy trailing him, a man who learns to speak Bangla better than many Bangalis, who is helpful to everyone, someone who neighbors think is one of them? Bangladesh is not hospitable to refugees, as we’ve seen with Rohingyas. We’ll have to stretch our story. A second-generation returnee maybe? This being Dhaka, we’d have to add an army of servants and guards. And when there’s a murder, you can bet that suspicion will fall not on a resident but servants or darwans. Told in today’s Dhaka, the story might become less about migration and identity and more about class divisions and lack of trust among ourselves. The elevator could continue to play a central role. Don’t we have elevators barred to servants? Couldn’t Marini fit well here as described by Amedeo: “He never stops repeating that the elevator is civilization and that the fundamental difference between the civilized and the barbarians, lies, first of all, in safeguarding the elevator”? If you get a chance, read Lakhous. He’s also funny. I’ll be looking for another of his books: Divorce Islamic Style.